The troubled musician was due to attend the screening of new documentary The Libertines - There Are No Innocent Bystanders, which opened this year's East End Film Festival and follows the rockers as they reformed for last year's Reading and Leeds festivals. But organisers and fans were left disappointed after Doherty - who was warned earlier this month he could face jail after pleading guilty to cocaine possession - did not turn up for the start of the event. 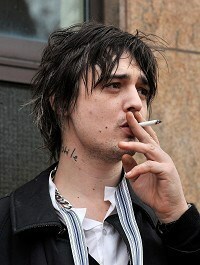 The Libertines' other vocalist and guitarist Carl Barat, bassist John Hassall and drummer Gary Powell were joined at London's Troxy venue by film-maker Roger Sargent, who admitted Doherty had found the documentary "very emotional and kind of difficult to watch". "I think possibly by actions or accident they're quite honest and open with me. They were very honest and open about their bandmates and that's kind of hard to watch," he said. "It's the first time you'll ever be able to see the truth really. Certainly with Pete it's just been lies until this film - he's been demonised and projected as some kind of villain in a horror film almost, and it's not really like that." He added: "He's a really sweet guy, he's the cleverest person I've ever met in my life. "One of the reasons I think people fall foul of him in a way, good and bad, is that he's very alluring, very charismatic and everybody that meets him kind of falls in love with him. And that can have good results and bad results as we've seen in the last few years."